A puppy comes to 14 year old Akari just when she is trying hard to be strong after her mother fell ill. She falls in love with the puppy immediately and names it "Socks" after its white paw markings. Akari's mother let her keep the dog, but made her make 10 promises to Socks. However, Akari slowly drifts away from Socks as she grows up, until one day she remembers the 10 promises that she made to Socks and her deceased mother. As mentioned earlier in my DVD review of "A Tale of Mari and her Puppies", the Japanese sure has a penchant for puppies and dogs. 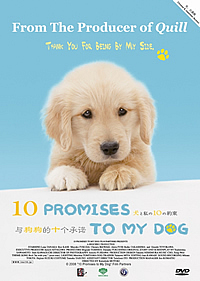 From the producer of "Quill" (for the uninitiated it’s about a Labrador Retriever who serves as a guide dog for the visually handicapped) comes "10 Promises for My Dog", another heart-warming tale of a golden retriever and her owner, Akari. The movie opens with a 24 year old Akari recounting her past when she was then a 14 year old school girl growing up in a closely-knit family. Her mum is a housewife and her Dad is a surgeon who practically missed out on Akari’s childhood as a result of his work commitments. Before long, tragedy strikes the family with the passing of Akari’s mum but before her death, she wants Akari to take up the responsibilities of dog ownership hence the 10 promises before she can adopt Socks, the golden retriever. The amazing thing is you play the DVD knowing how mushy it’s going to get or certain turn of events can be quite tear-jerky but still, it touches the heartstrings at the end. Certain plotting is an exact reflection of our daily life. Akari neglected the existence of the aging Socks when she embarks on her career, this clearly exemplifies the fact that we do neglect our love ones when we buried ourselves in our daily routines. We forgot the fact that when we were young, our parents were there for us and when they get older, we might not be there all the time for them. We see ourselves through the eyes of Akari and Socks. This is not a preachy movie and everything here onscreen is so surreal yet so beautifully captured, take for example the cherry blossoms and the generous shots of the beaches. I’m greatly touched by the relationship portrayed between father and daughter and of course the greatest cast member in the movie that doesn’t have a line of dialogue, Socks. Inspired by The Ten Commandments of Dog Ownership, "10 Promises to My Dog" is another educational, heart-warming story that is suitable to all. From here, we learnt that dogs are more than mere man’s best friends, they are family. No qualms about the visual & audio and the DVD comes with a choice of the original Japanese track and a dubbed Chinese audio track.